1. Purpose: The purpose of the Traveling Gavel shall be to encourage Stated Meeting attendance and to promote fellowship between symbolic lodges of the district by travel and visitations during the year. 2. Government: The Traveling Gavel shall be managed by the Officers of the Ninth Masonic District Association, with the reporting assistance of the current elected Worshipful Master’s in the district. a. The Worshipful Master shall be the final authority on awarding the gavel in times of delegation ties, confusion and other circumstances not included herein. 3. Commencement: These requirements replace the formerly adopted rules dated December 6, 2014. The district president shall at the December 5th, 2015 District Meeting award the gavel to the district lodge with the largest delegation of brethren present and thus implement this program. 4. Maintenance: For historical posterity a notebook to record visitations and gavel ownership shall at all times accompany the gavel in its travels. a. The Worshipful Master in possession of the gavel shall immediately notify the Ninth District President and/or Secretary when the gavel is assumed by or relieved from his lodge. 5. Security: Since the gavel is intended to promote fellowship among the brethren of our symbolic lodges, the gavel shall never be awarded to any other Masonic Organization, or a Lodge that is not a member of the Ninth Masonic District. In addition the possessing lodge is charged with the safety, security, and trust of custody in handling this historic implement. The gavel shall be available for surrender at all ‘meetings’ of the possessing lodge, whether a special or stated meeting.. The traveling Gavel will not be in play at any District functions. On Stated Meeting night or Special Meeting Worshipful Master shall determine the winning delegation and award the gavel. To be awarded the gavel a visiting lodge delegation must have in attendance a minimum of one lodge officer and four (4) members of his lodge, for a total minimum visitation of five (5) brethren. When two or more lodges are in visitation the delegation with the largest count of visiting brethren present shall be awarded the gavel, provided all other requirements herein are met. In the case two or more lodges tie in total visiting brethren present. 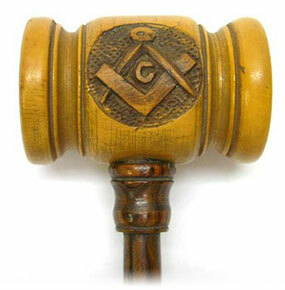 The lodge with the senior current lodge officer such as WM, SW, JW shall be awarded the gavel. Provided the WM, SW, JW are not in attendance, or it still remains a tie; winner shall be determined by most total number of current elected & appointed officers present in the visiting delegations. In the case that two delegations are tied in number and seniority the gavel shall be awarded to the group from the oldest lodge, by charter date not lodge number. To be officially recognized in the count all members of the visiting delegation shall be in attendance for the opening & closing of the meeting. Late arrival forgiveness shall be at the discretion of the sitting Master. Plural, EA, FC, and members of good standing shall be included in the delegation count, provided those members shall not be counted if they are a primary member of the lodge being visited. District Association Officers, District Education Officers, and District Deputy Grand Masters shall have no additional seniority in delegation count, besides any lodge position currently held. The sitting Master is required to award the gavel to a visiting delegation provided all rules contained herein are abided to. Immediately after the meeting he shall insure the notebook is updated, turn over the gavel to the senior visiting delegation member and inform the District Officers Association. In all instances the awarding Master, visiting brethren, and the possessing lodge are reminded of the purpose of the gavel. Visit often and pass it regularly in the spirit of good fellowship. The District Officers Association does hereby implement the Traveling Gavel and these rules December 5, 2015.